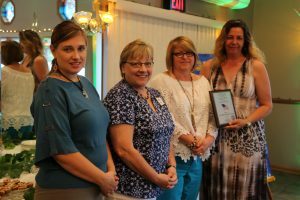 Congratulations to Oak Hill Supportive Living in Round Lake Beach! Oak Hill was recognized by the Round Lake Area Exchange Club for their commitment to displaying the American flag! No symbol better signifies our nation’s greatness than our American flag—the Stars and Stripes. The Proudly We Hail program encourages regular display of the flag by individuals, commercial establishments and industries.